Reports From the Field | ECIR Group, Inc.
A wonderful and wise group who are the backbone of helping everyone get through though learning curves when our equines get diagnosed. Thank you for everything you do for all of the equines! Dr. Kellon and ECIR helped my beloved Arab recover from laminitis in 2003, and remain sound and healthy ever since. Thank you! This group has been a lifesaver for me when I could not find support elsewhere. Thank you for providing support and information on probably one of the most important issues for the equines in our care. I love and respect all your hard work. THANK YOU. Thank you ECIR gurus for your endless diligence and patience!! Thank you for solid information and the willingness to share it. Such a great resource. I have learned so much and appreciate the continued learning and support which allows me to better support my clients. The ECIR list has taught me so much over the past years; I would like to acknowledge Dr. Kellon, the volunteers and all the members of this group for my horse Lad for always being sound in all the years I had him. Lad was diagnosed back in 2005 and never had any issues related to his Cushing's or IR with the help of this group. To all the hardworking moderators and members of ECIR and Dr. Kellon for their caring and their research to help our IR and PPID horses. In support of an awesome group of knowledgeable, dedicated vets, scientists, hoof guru and volunteers. Thank you for your help with my two insulin-resistant horses who are sound and healthy from following your protocols. Very grateful this group is here, and shares so generously with those interested in learning. 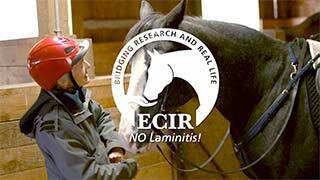 ECIR brings real hope and real help to horses and the people who love them. We can never thank you enough. Thank you for all you have done for my horses and me! The ecirhorse site was a lifesaver and I continue to learn from the collective experience and wisdom of those in the .io group. This is undoubtedly the most helpful group on the internet! My equine guys are healthy and happy due to their care being based on ECIR information. For the volunteers and all the horses past, present and future that so patiently teach us. My IR/PPID mare takes me on 2 hr trail rides 2 or more times a week. She has over 100 hours and 300+ miles logged on the trail in 2016. We are living the good life. I have followed this group and its wonderful advice for over a year now. The information has proven to be so very valuable in helping me manage my horses IR / Cushings. I am so blessed that this group exists and is supported by such knowledgeable people. Thank you! Thanks to ECIR I have learned how to treat my horse with PPID/IR. GREAT website, GREAT info, GREAT people. This group is why my beautiful little appaloosa gelding has been a sound and happy partner for over 4 years now. I am eternally grateful! My horses, and I are SO blessed to have the ECIR group! I truly don't know, where my horses' health would be without their knowledge, guidance, and support. You are all very dedicated volunteers who have helped me in my darkest hours. Thank you so much. Special thanks to Dr. Kellon for all she does. This group of knowledgeable people has been a life saver. Thanks to them, I have one horse who is comfortable in his old age and the other still functional and rip roaring to go! Thanks to the ECIR group, my mare is happy and sound, and in as good health as can be expected! I really appreciate the tremendous effort and time put in by the volunteers. I have learned and continue to learn so much and my horses are so much better off because of this group. You were my crutch during the darkest hours of my Zeke's battle with EMS and founder. We have come thru it with the help of some amazingly wonderful support, and in the process have found many new friends. Will always be grateful to Team Zeke. Keep up the good work. It's wonderful to see the benefits for the horses and ponies. In support of an awesome group of knowledgeable, dedicated vets, scientists, hoof guru and volunteers. Thank you for your help with my two insulin-resistant horses who are sound and healthy from following your protocols. I was "in the dark" when my first horse had PPID about thirty years ago. Thanks ECIR! I am not "in the dark" anymore. Now I have a highly IR mare that is thriving because of your knowledge and dedication to education. She would not be alive without you. My learning curve has been steep and it's a good feeling to not feel "out of control". Grateful every day!